If you want to create awesome paintings in Photoshop, you are going to need a great set of brushes and the know-how to use them. Join one of the entertainment Industry's leading experts, as Lee Kohse shows you how to create high quality brushes in Photoshop. Lee will also show you the settings that you need to make them work the best way. Then watch over Lee's shoulder as he paints a real project. Watch and learn as Lee redesigns the iconic "Voltron" in a Steampunk style. Starting with a shaded sketch, you will learn the secrets to painting with custom brushes to create natural and realistic texture and detail without that overly CG look. Lee includes over 100 custom brushes for your immediate use on this DVD. This fast loading DVD ROM contains 3 hours of sharp video. The advanced interface allows the user to instantly jump to any of the lessons with complete control over the playback. All the lesson files are included, so you can follow along at your own pace! This is your chance to sit down with one of the industry's leading experts and discover the secrets and digital workflow for the pros. This is your chance to sit down with one of the industrys leading experts and discover the secrets and digital workflow for the pros. 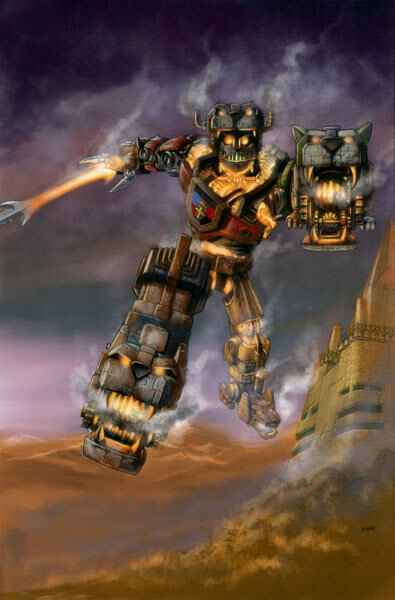 Watch as Lee paints a Steampunk Voltron. Learn to use the mixer brushes added in Photoshop CS5. Watch a real project, start to finish (Portions are sped up so you will see every brush stroke without going cross-eyed). © 2019 Software Cinema. All rights reserved.